The church of Saint Demiana in Papadouplo is a very small and poor Coptic Orthodox church, and the surrounding “streets” are very narrow – about four meters wide. For several months residents nearby witnessed strange flashes of light appearing over the church. On the evening of Tuesday, March 25, 1986, the Holy Virgin Mary started her appearances in the church of Saint Demiana the Martyr near El-Teraa El-Boolakia street in the overcrowded Shoubra quarter of Cairo, Egypt. Our Lady appeared beside the two towers of the church and was first seen by people living in the houses overlooking the church’s towers. Her light shone into their houses, and they saw Her in Her full body surrounded by a halo of light over the western dome of the church. This apparition repeated several times. Then the news spread and people from all sects and religions came to see these supernatural appearances. The very narrow streets became overcrowded with thousands of night vigils praying and singing doxologies, liturgies, and hymns to the Mother of True Light for entire nights. The committee examined the accounts of eye-witnesses, and on Thursday, April 10, at midnight, the members of the Papal Delegation went to the church to watch closely the reported spiritual phenomena. They stayed there till a little before morning. At 3:40 a.m. on the dawn of Friday, April 11, they saw the Holy Virgin in a clear form surrounded by a halo of light; this apparition lasted until 5:00 a.m. 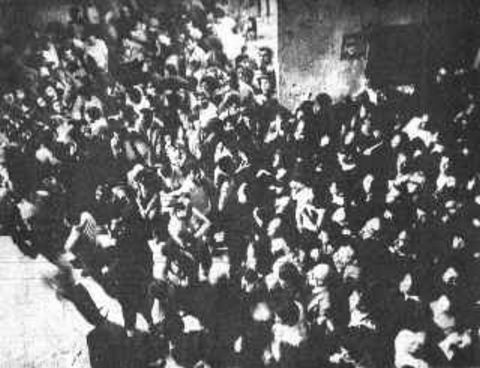 This headline, “Spiritual phenomena seen by thousands in Shoubra quarter,” was published Sunday, April 13, 1986 in the Egyptian weekly Watani newspaper. A very luminous and radiating unnatural light appeared inside the church tower and was shining to the outside. The two towers above the church roof do not connect with the church interior. This light in the towers continued to shine even after the electric current was cut in the whole quarter, creating a power outage for a complete hour during that Friday night. The committee concluded that “these apparitions are a blessing for Egypt and a blessing for the Church.” The committee returned to the church on several other occasions after this and were again blessed with more appearances of the Virgin Mary along with other spiritual phenomena. The apparitions also occurred during the daytime hours. Blessed Mary appeared inside the church on the eastern side of the altar and on the inside of the church dome next to a painting of Her Son Jesus. During the Holy Mass held by Father Heg. Dawod Tadros on the morning of Friday, June 20, 1986, a very clear appearance of the Virgin Mary occurred. She was holding our Lord Jesus Christ in Her arms. These apparitions were not limited to luminous transfigurations. At other times flames were seen, surrounding the Blessed Mother like “tongues of fire” that eventually evolved into a very bright light. Members of the Papal Delegation witnessed this supernatural occurrence. 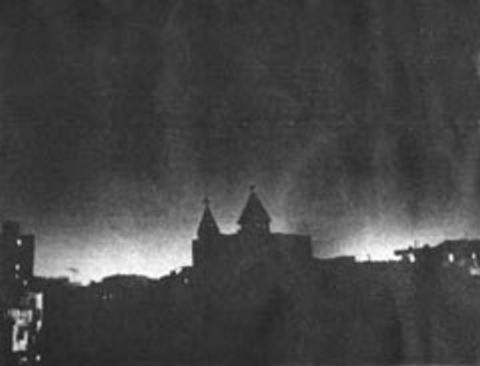 Also on April 10, at 4:00 a.m., a flame of light was seen extending from the western tower of the church and then returning to it, turning the darkness of the night into light. The flame had a wavy surface, showing interlaced tongues and waves of light and fire. It varied in color from orange to very bright white. Saint Demiana also made appearances, sometimes preparing the way for the Holy Virgin. 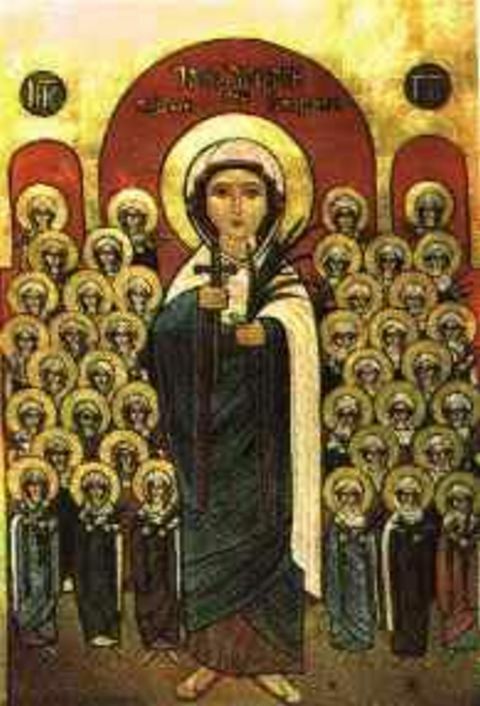 One time Saint Demiana was seen holding a green branch. On another occasion both St. Demiana and the Holy Virgin were seen emerging from a luminous mass that had been moving from the west toward the east. The mass disappeared and the Virgin remained clearly in sight. She extended Her hands toward the crowds and then moved towards the balcony inside the church. Then she moved upwards into the sky until she disappeared from sight. On another occasion a white light shone over the western tower and illuminated the wooden cross, making the cross appear as if it were a flame. At another time light radiating out from the western tower took on an oval shape. A white pigeon appeared in the middle of this light, opening its wings and then flying over the church. The Blessed Virgin appeared out of this same kind of light on another night. Writings in Coptic letters were seen in the sky. On the night of April 13, 1986, the Virgin Mary appeared in Her full body of normal size in three bright and luminous colors: white, blue, and red. Her whole body was luminous and could be seen beside the church domes overlooking Abd El-Metaal street. This appearance only lasted a few seconds just before one o’clock in the morning. Thirty minutes later the apparition repeated — along with several flashes “like lightning,” appearing along the wall of the church. Crowds pack the narrow streets to see the Virgin. Dr. Fayez Akhnoukh examined the child and tested the acuity of both of her eyes. He confirmed that the girl has been healed miraculously. The church recorded and documented this miracle. 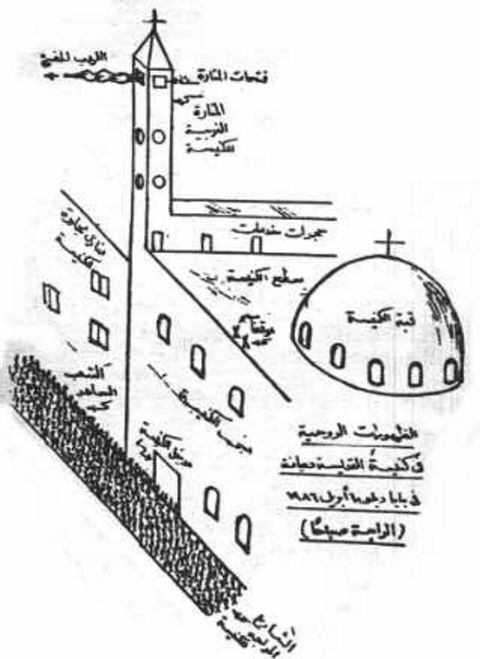 Pope Shenouda III approved these apparitions in Shoubra.